“Exclusively For White People” won’t fly in Austin. When it comes to racist business signs, there are the sort that are deliberate and the sort that are accidental. It’s not hard to accidentally change Rich Whitney to Rich Whitey, and freshly ground black people is a typo, not a real ingredient in a meal. Still, some Austin, Texas businesses opened for business with some nasty new editions. 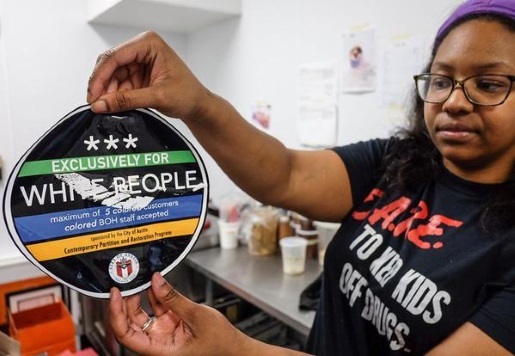 Last night, someone put “Exclusively For White People” stickers on Austin, Texas businesses. Needless to say, the liberal city is up in arms, and no one’s angrier than the mayor. It’s unclear how many businesses were defaced with the stickers, because the businesses were understandably proactive about scraping the stickers off before anyone saw them. Still, the damage is done, and police are undoubtedly looking into the unusual crime.